Plurinational State Foundation Day (Día del Estado Plurinacional) is a public holiday in Bolivia celebrated on January 22. It has been celebrated since 2010. 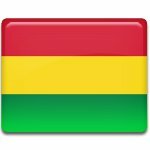 The country's official name was changed to the Plurinational State of Bolivia by the 2009 Constitution of Bolivia in recognition of the multi-ethnic nature of the country. The new constitution was promulgated by Evo Morales, the first President of Bolivia to come from the indigenous population. Evo Morales was born in 1959 to Dionisio Morales Choque and Maria Ayma. He comes from a poor family of the indigenous Aymara people. His political career began in the early 1980s when he became the head of a tread union of coca growers. In 1995, he co-founded the Assembly for the Sovereignty of the Peoples. After a schism in the party, he formed the Movement for Socialism—Political Instrument for the Sovereignty of the Peoples. In 2005, Morales won the Bolivian general election and became the President of Bolivia. His inauguration took place on January 22, 2006. The anniversary of this event is now celebrated as Plurinational State Foundation Day, although Bolivia officially became a plurinational state in 2009 when the new constitution came into effect.